People that suffer from addiction often have complicated family dynamics that can make recovery more difficult for everyone involved. Addiction affects everyone in the family and there may be many relationships that have been damaged as a result of the person’s substance abuse. Attending family therapy is a necessary and greatly beneficial part of our addiction treatment and recovery program. Family issues can be closely connected to a person’s addictive behavior and guidance from a therapist can help family members work out some of these issues. It is important for a person with an addiction to have a stable home life and try to repair some of the rocky relationships they have with loved ones. Conflict at home will only serve to fuel their addiction and make it much more difficult for them to remain sober. The goal of family therapy is for the addict and the people closest to them to learn how to resolve personal differences, talk about problems in a constructive way and learn to be more connected. A healthy family life can be an essential part of living a sober lifestyle and maintaining better mental health. We understand the importance of family dynamics and make sure to incorporate regular family therapy sessions for each patient in recovery. There are many reasons that treatment should include family therapy in order to allow the patient the best possible chance for success in recovery. Numerous studies have shown that treatment approaches that involve the family have better engagement from patients and higher rates of success. Patients who take advantage of family therapy are often more committed to their sobriety and participate more in aftercare programs. 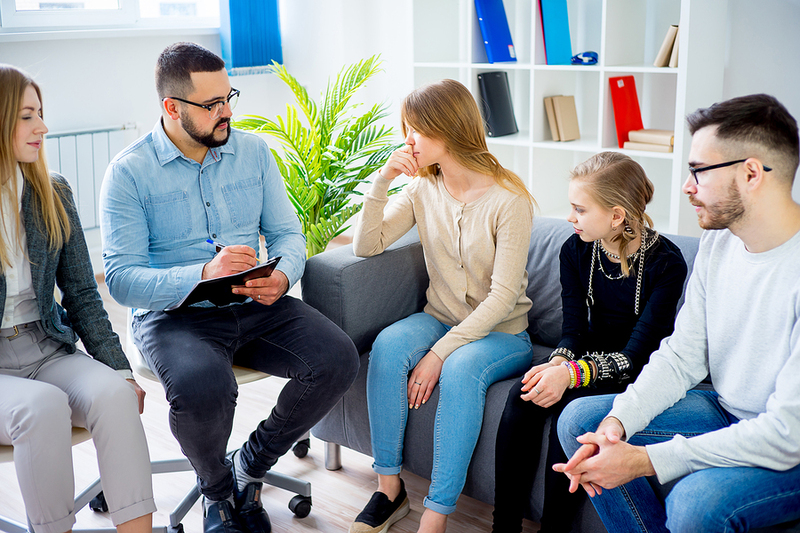 While individual therapy gives the patient a chance to focus on their own personal problems, family therapy helps them gain awareness of their behavior and how it affects others. They can learn to improve their communication style and the quality of their relationships with those that are closest to them. Many addicts struggle with their ability to communicate with others and it is an important skill they must learn throughout treatment. Family therapy not only helps addicts, it is an opportunity for their loved ones to improve their own communication and gain more awareness about addiction. Family members can use these therapy sessions to learn self-care and how to increase the quality of their relationships. The group as a whole will feel better once they have completed several sessions. Family members also need to learn how to avoid any enabling behaviors that could endanger the addict later on when they complete their treatment. People in the family may have a tendency to enable the addict without even realizing. Therapy allows them to become more educated about addiction, codependent behavior and the best way to support their loved one in their sobriety. Attending group therapy sessions for the family is not only to improve their relationships and allow healing, it is also a way to reach important recovery goals. Everyone in the therapy sessions will need to put in some time and work to practice what the therapist teaches them whenever they meet. This means applying what they learn to see how it works to improve family relationships. The biggest goal of family therapy is creating a home environment that will be stable, loving and free from stress and conflict that could endanger the addict’s recovery. The home should be a safe place with positive communication and everyone should have the ability to resolve issues effectively. Family life doesn’t have to be perfect, but for an addict their relationships with their family play a major role in their recovery. Ideally the family members that the addict currently lives with or spends the most time with will need to attend therapy sessions on a regular basis throughout the patient’s treatment program. The therapist will ask for input from everyone in the group and ensure that they are all on the same page as far as improving family life. If everyone participates and does their share, family therapy can create a lot of positive change for those who attend. Family therapy can help improve social functioning for an addict, make it more likely for them to stay in treatment and reduce harmful behaviors. It can also reduce the occurence of separation or divorce and create better relationships overall. Staying focused on the goals of family therapy will create a better outcome for everyone involved. The Gooden Center understands the importance of family dynamics in an individual’s life and how their family relationships affect their health and stability. If you are interested in family therapy, we have options available in our treatment programs to incorporate key members of your family into your recovery plan.